We have a very dedicated team of staff who have worked for us for many years and know our clients and the area well. Steve James has lived in the Te Anau basin for 39 years and has a wealth of knowledge and experience. Our clients can be assured that their work will be carried out to a high standard and in an efficient and timely manner – something we are proudly known for. ​When clients ring Steve, he can often be found in a tractor – it’s his passion! Diesel is in the blood. For more information about Steve and the James family, who are all involved in the business, click here. Kerrin Wilson, also known as Rocket, is our full time mechanic but also brings with him a huge aray of skills with operating machinery. Over the winter months he performs all of the preventative maintenance to ensure breakdowns are kept to a minimum over our busy season. Jock Burgess, Kerri’s father, is always the first to work and thrives on getting the job done. He has been crucial to our business with training any new staff. Somebody behind the scenes that is equally important is Kerri’s mum Phyllis. She does an amazing job of looking after the gardens at the motels and she is always available to watch the grand kids and supplies the most amazing baking!! Jock can mostly be found discing and operating the roller drill along with helping in the balage paddock. Steve Futter has been with us for three years now and comes from an accounting, farming and machinery-operating background. He is often discing, baling, driving the truck and also helps Rocket over the winter months with maintenance. He is very active in helping Shelley with our Health & Safety system. Bradley Leslie has been with us for three years and originates from the Far North. He has a background in forestry, pest control and operating machinery. He can be found in the summer months operating the discs, and helping in the balage paddock the remainder of the time spraying and fencing with Kane. ​Kane Walsh, our son in law, started working for us over his Christmas holiday break while building in 2007. This sparked a passion in him for the agricultural industry. He is now in partnership and runs the Direct Drilling side of the business. They also have a Fencing and Ag Spraying business. ​Shelley Walsh, our daughter can often be found driving the rake over the balage season, she also works in the office and is our health & safety officer. Over the busy months we also have seasonal casual workers to compliment our team for our busier times. In 2016, Steve and Kerry were invited to join a tour in the USA hosted by Case NZ . 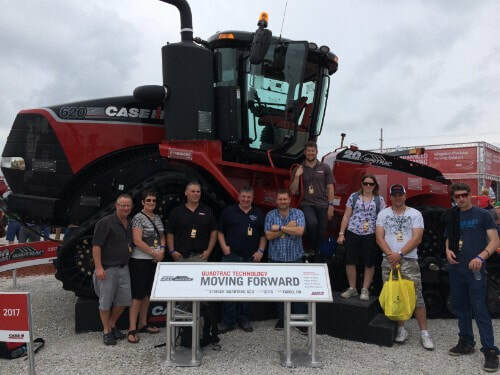 It was the trip of a lifetime where they visited the Farm Progress Show outside of Demoine Iowa and then went on to Chicago and visited the Case Magnum Factory at Resene – very fond memories with a group of like-minded people!